Yet another quest for more arm candy DIY. 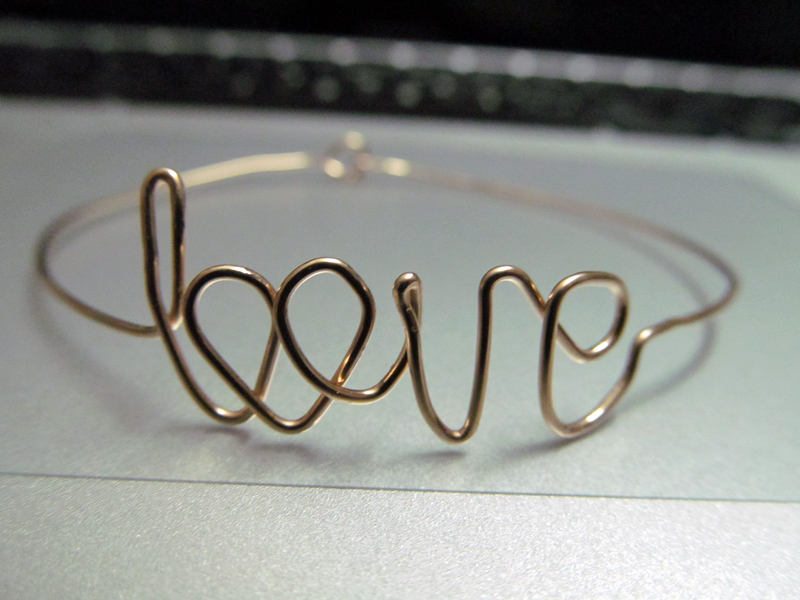 I tried out using gold-filled wires to make word bangles, and I'm quite pleased with the results! Hence a new addition to my barrage of homemade arm candy! I used the thickest wire that was available at the craft store- 0.8mm 14k gold-filled wires. It wa rather difficult to shape the wording, but the thickness ensured that the design isn't easily twisted awry and it isn't malleable. One good tip is to draw the design out and use the wire to 'trace' the design. This will ensure that thr alphabets are uniform in size. The closure of the bracelet was a simple hook fashioned from the remaining bits of wire. With the two free ends, I made one side into a slightly flattened S-shaped french hook while the other end was bent to form a close loop. Since the bracelet was customised to be of exact fit, the hook closure was extremely secure. I love how the bracelet looks while stacked against other arm candies! Definitely a good layering piece. It can be made with different colored wires and form other words (or even symbols), so the possibilities for DIY is endless! I think I shall try this out! 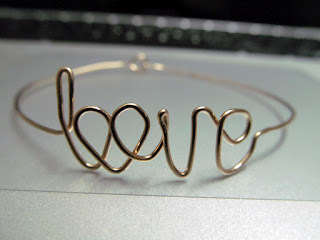 Although I have thin wire :/ any suggestions on making jewelry with thin wire? Hi there! If your wire is thin and very flexible, you can try the wire-wrapping technique. If you have already made the outline you can coil another layer over it so that the shape holds :) you can even wrap in beads for such a bracelet too!